Welcome to the home of Filigrigold Golden Retrievers. 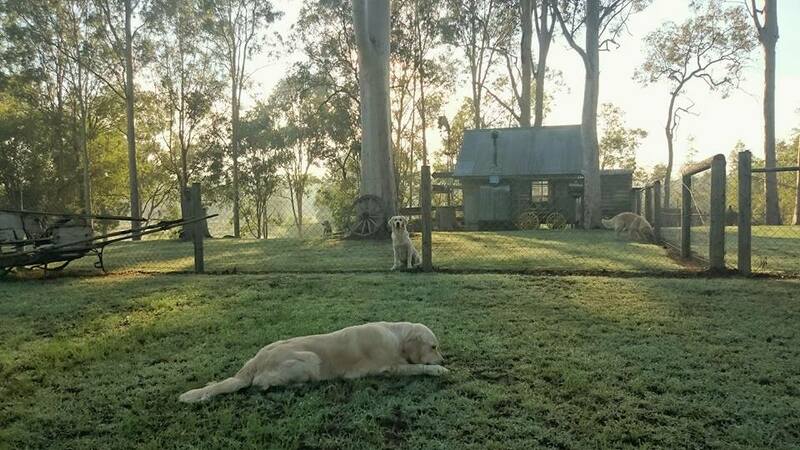 We are a small family kennel situated on hinterland acreage south of Brisbane. Our romance with Golden Retrievers began almost 20 years ago when Rob and I were first introduced to one another by Rob’s then Golden Retriever “Solomon”, a real Golden character in a real life love story, which was to be the beginning of our new life as a family. We have been owned by and involved with Golden Retrievers ever since, mostly as our companions and much loved members of our family. Then one serendipitous day, almost five years ago, we came upon a little fork in the road by the name of “Willow” (Bicklewood Follow Your Heart purchased from Dr Ian and Wendy Johnson of Bicklewood Goldens). Willow was our first ‘show girl’ and it is she who prompted us to change our direction in terms of our relational interest and activities with Goldens. She ultimately piloted us into the show ring, and beyond, albeit nowadays the increasing demands of our work and family life limit the time available to attend shows but we do enjoy ring-craft and make a concerted effort to compete with our Goldens at several shows a year, focusing on breed specialty shows in particular. We could not imagine life without Goldens in it, and the journey with our own Goldens, learning of their 150 year old heritage, and meeting and talking with all manner of Golden Retriever enthusiasts over the years, would lead to a calling in our heart to become faithful breeders of this truly charming, old world breed. The dawning of Filigrigold soon followed, and with it a pronounced sense of dedication to the preservation of the Golden Retrievers nobility, its nostalgic past, its hallmarks, and the remarkable legacy its founding father, Lord Tweedmouth, had left for each of us who are privileged to partake in the custodianship of the breed we so adore. This is Filigrigold’s heartfelt commitment. Needless to say, Goldens were, and will forever remain, THE central hub of which our lives orbit. Currently, we are owned by six beautiful Golden girls “Willow”, “Paris” (from Goldbrior Kennels), litter sisters “Madonna” and “Theron” (from Alubyc Retrievers), and our own Filigrigold homebred babies Betty and baby C’Belle, each of whom enrich our lives immeasurably and fill our home with bundles of Golden hair strands but most importantly lots of joy, laughter and love…and the greatest of these is LOVE. Several of our girls make up our show team and select breeding program, though certainly they are ‘ALL’ cherished members of our family, and enjoying family life with us comes before anything else. At Filigrigold, we aim to produce ‘quality’ over quantity with conformity to the breed standard being of utmost importance. We are dedicated to producing Goldens that reflect the breeds hallmark friendly, calm and biddable temperament, quintessential to its most renowned role as a kind, loving and faithful companion. We place considerable value on structural soundness and true classic type, both of which are considered pivotal in producing Goldens with natural working ability for activities such as obedience, agility trials, and retrieval field work, the latter purpose of which Goldens were originally bred. Our dogs are bred exclusively to English/European bloodlines. Each sire is selectively chosen for his proper temperament, correctness and conformity to the breed standard and his suitability with our breeding program. All breeding stock are screened for hip and elbow dysplasia, hereditary heart and eye diseases and DNA tested for ICT-A, PRA-1, PRA-2, PRA-prcd, MD and DM. Our puppies are well socialized and are raised in our home in a family environment. We occasionally have puppies for sale to approved homes only. If you are seeking a Golden puppy please email us at filigrigold@bigpond.com to request a copy of our ‘puppy questionnaire’.